The 10 Best Pasta Places in Iowa! If you are craving some pasta and homemade sauce, the state of Iowa has you covered. From the east, west, north and south you can find locally owned, authentic Italian restaurants in every corner of the state. For the best pasta places in Iowa, it always goes beyond the menu offerings and fresh ingredients, and all the best Italian restaurants offer much more in terms of ambiance and an attentive staff. Check out these 10 best pasta places yourself and be ready to find your new favorite place to eat. Well recognized in the Iowa City community as some of the best pasta purveyors in the state, Basta is Italian for “enough,” or loosely translated, “just right.” If you find yourself at this casual and modern Italian ristorante, you’ll understand the meaning after a single bite of their fresh made meals. Served with authentic recipes and local flavors, you’ll find exactly what you need at Basta of Iowa City. For an excellent dining experience at a locally owned, authentic Italian ristorante, Napoli’s of Marion has a full menu of all your favorites. The two brothers that own and operate this fan favorite Italian ristorante come straight from Naples, and so do their wide food selection. While it’s hard to go wrong with anything off the menu, popular favorites include pasta primavera, fettuccine bravissimo and penne bolognese. With the option to dine al fresco on the patio at Napoli’s, now is one of the best times of year to check it out. A Des Moines institution of great pasta and side dishes, Spaghetti Works is in the historic Court Avenue neighborhood and lends great access to many surrounding attractions. The ambiance is half of the fun at Spaghetti Works, and the menu items comprise the other half. Popular favorites, including the vast salad bar options, include a classic spaghetti and meatballs, signature sauces and a specialty Hot Italian Pie. For a classy night out alongside your pasta, the Brown Bottle of Cedar Falls is perfect for a special occasion, weekly celebration or as a standalone reason to get out of the house and do something fun. With a long menu of savory flavors, including seafood lasagna, chili pepper penne and roasted garlic pasta, the flavors don’t stop with just the pasta offerings at the Brown Bottle. Family owned and operated, Pasta Bella of Mason City recently upgraded their serving space, and now alongside the classic Italian dishes you’d always expect to find, a comfortable atmosphere surrounds your entire meal. While the soups, appetizers and salads are all worth some attention, it’s the homemade baked pastas and hot dishes that really get the mouth to salivate just sitting in the lobby. Serving the Clive community and surrounding Des Moines metro since 1993, Cosi Cucina provides the entire dining experience. A great atmosphere, well-executed drinks and pasta recipes that can transport you back to the homeland, it all can found in a night at Cosi Cucina. Available for lunch or dinner, popular pasta favorites among many include ziti cucina, smoked chicken penne and a cavatelli casserole. Another Des Moines favorite and longstanding institution, Noah’s Ark has many great menu offerings to choose from, but you’ll never go wrong with their pasta selection. Besides a great atmosphere and perhaps the friendliest service you’ll ever encounter, Noah’s Ark specializes in homemade sauces and recipes. 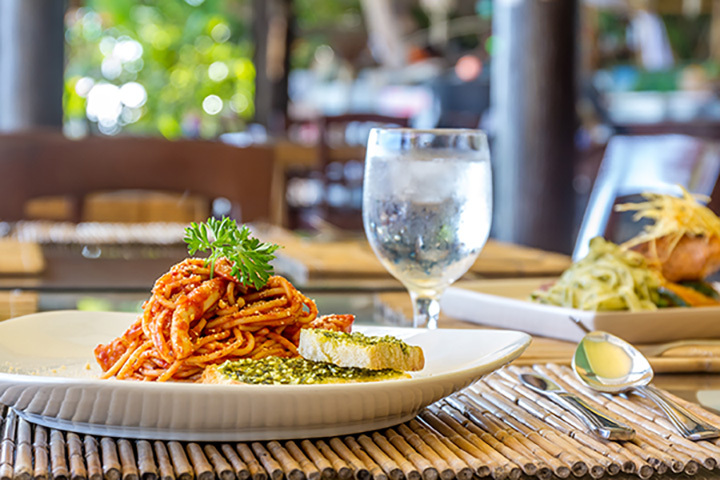 Pair it all with a nice glass of wine or your favorite cocktail, and you’ll quickly see the secret behind success at this local favorite Italian restaurant. For a well-executed pasta dish in Ames near the Iowa State University campus, Ge-Angelo’s is the place to go. Serving hot, fresh and made-to-order Italian dishes for over a decade, Ge-Angelo’s has come up with the right recipe for a fun dining experience. While all the pasta selections will have you coming back for more, the house-classic Geno’s Spaghetti and Meatballs easily cements this establishment as one of the best pasta places in the state. A great way to top off or begin your Iowa Great Lakes vacation, Giovanni’s of Storm Lake provides the right taste for succulent flavors. Inspired by traditional recipes and served with a modern flavor, a few of the must-orders at Giovanni’s include baked lasagna, spinach ravioli and pasta primavera. Everything on the menu pairs nicely with the comfortable atmosphere and attentive staff, making each visit as memorable as the last. Iowa City has no shortage of great places to eat, and when it comes to pasta restaurants, there is no exception to that statement. Baroncini Ristorante is another pasta and Italian option that makes for a special occasion. Even if you are just celebrating the end of a day, the fine fare and classy atmosphere of Baroncini Ristorante sets a high bar for all future restaurant visits.